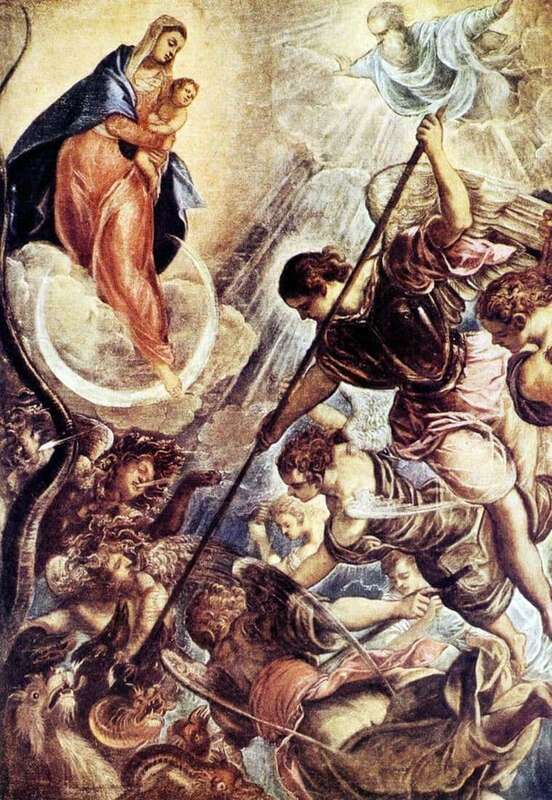 “The Battle of the Archangel Michael with Satan” is a picture written by Jacopo Tintoretto on a biblical story. The New Testament of the Bible speaks of the great battle between good and evil. The devil in the guise of a dragon fights with the archangel. The artist here does not depict the usual dragon, but the ten-domed one, as the Bible says. His heads twist around his long necks like snakes. Angels soar around. The artist does not depart from the well-known plot and depicts evil and good angels. After the defeat of Satan, evil angels (called demons or demons), together with the devil, were forever cast out of heaven. Although in the title of the painting we see the name of only one saint – Archangel Michael, the artist also decided to depict other figures important for the Christian religion. So, in the upper right corner is God. He soars in the sky, as if bursting into the space of the picture through the fluffy clouds. From his figure comes an incredibly bright light that illuminates all of his subjects, fighting for good. In the upper left corner is the Mother of God with the newborn Jesus in her arms. Frozen on the edge of the air cloud, she leaned down a bit to look at the progress of the battle. There is no belligerence or anger in her, her expression is absolutely calm. The woman is shown in simple clothes – a red long dress and a blue cape. Her left foot is on a white crescent, which is more like the glare of the sun. Archangel Michael is depicted in a martial pose. His body is tense figure tilted down. In his hands he holds a long, sharp spear, which strikes Satan. The picture is visually divided into two parts. The background at the top of the work is drawn in a light, almost white color. This color scheme was not chosen by chance – white symbolizes purity, faith, purity. Immediately under the airy, snow-white clouds, a blue background, symbolizing the sky, begins to appear, darkening towards the bottom.